This week Microsoft officially announced pricing for it's new Windows 7 operating system. As expected, the retails pricing is a little higher than Vista but seems to be about the same as Windows XP when it was launched. If you're interested in saving over 50% on pre-order discounts just click here. Order today and your copy of Windows7 will arrive on October 22nd. The following pre-order offers are available through July 11th and limited to 3 copies. Unfortunately, these specials are not available in Europe at this time. Here’s the deal. Windows7 Home will provide most of the features you’ll need including the Aero graphical interface, Multi-touch enhancements, Easy Networking, and improved Multimedia improvements. Windows7 Professional includes Windows XP mode which you may need for compatibility of some software and devices. Professional also includes an automatic backup programs. You’ll want Windows7 Ultimate if you expect to use BitLocker and/or you want multiple language support. No, it’s not under attack by rebel’s in Iran. It’s the same old malware attacks using popular topics or trends on Twitter. It’s natural as soon as something on the Internet is popular, it will be the target of greedy, bad guys. These days most of the buzz is about Twitter and sure enough Twitter is the new playground for evil tricksters. The popular attack continues to be the old “You have a virus. Pay us to remove your virus or else”. The virus comes in the form of an rogue AntiSpyware program or what we I call ExtortionWare. Some other attacks will just trick you into entering a name and password. Twitter has a new system called “Verified Accounts”. This program is only meant as a way to confirm public officials and celebrity accounts. It does not mean the account is secure. Many celebrities are probably the worse at picking secure passwords. In addition, the more followers they have the more likely they’ll be the target of hacker attempts so these account may be the most dangerous to follow. Rule 3: Don't fall for the "Get more followers" scheme. Promises to get you more followers will ask you for your Twitter name and password. Once they have your password, they can send any message that appears to come from you including links to malware. Even the Apple MacIntosh is under attack. See this following video from Sophos. I’ve been very happy with the feedback and support I’ve recieved from my WinPatrol users over the years. A few years ago I added to my list of utilities a program called Task Catcher. While not as well known as WinPatrol, Task Catcher has still have a small group of loyal followers. 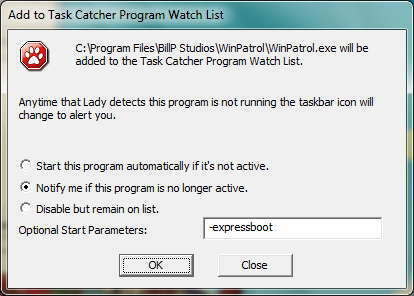 Unfortunately, I’ve been so busy making WinPatrol better I have let Task Catcher lauguish. 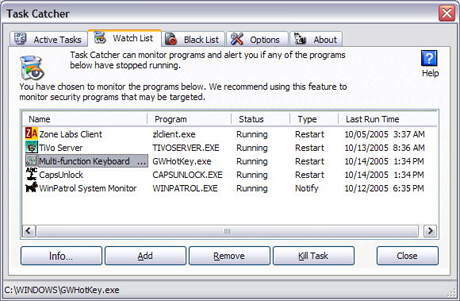 The main reason for creating Task Catcher was to monitor and help restart a program if for some reason it fails or has been closed without your knowledge. It’s something I wanted myself to help restart a server on my work computer and also protect my security programs from being closed down by malware. While WinPatrol’s main focus is on Startup programs and registry changes, Task Catcher with Lady the Kitty concentrates on actively running programs or tasks. If you want to be sure particular programs are always running you can add them to the programs “Watch List”. The next version of Task Catcher has a few improvements like the dialog above but I’m looking for more. If you have a specific need that relates to active tasks let me know. Email support@WinPatrol.com. Real-time monitoring without impact to performance. Watch List: Monitor is Programs are no longer running. Programs will either automatically be restarted or you’ll be notified and given that option. Black List: Block particular “known” programs from running either silently or with some notice. Active Tasks: Display task info including when a first launched. What information would you like to see included under Active Tasks? Any other task related monitoring you can suggestion? Let me know. Have you ever notice a filename that is so bizarre you think it must be some kind of malware? Microsoft Windows has supported long filenames for years but most folks still haven’t caught on. Microsoft is especially guilty of using short useless filenames like lsass.exe, mdm.exe and the most infamous ctfmon.exe. One of the features of WinPatrol PLUS is the ability to click on a filename and receive a human readable explanation. We try our best to let you know what a file does, if it’s safe and why you might need it. I keep track of all the requests to make sure I’ll can catch any new mystery files, good or bad. I’ve taken a snapshot of all our PLUS Info from last month and thought I’d share some of the top requests with all my readers. The number one mystery file that people want to know about continues to be “CTFMON.exe”. Here’s a little of what you’ll read in our PLUS databae. Ctfmon.exe activates the Alternative User Input Text Input Processor (TIP) and the Microsoft Office Language Bar. It monitors the active windows and provides text input service support for speech recognition, handwriting recognition, keyboard, translation, and other alternative user input technologies. Initially it only installed with Microsoft Office 2002 and XP. Now it may be used by a number of Microsoft programs that supports alternative user input. When you run such a program, the file Ctfmon.exe runs in the background. It remains in memory even after you quit the program. More detail on what the program does can be found at http://support.microsoft.com/default.aspx?scid=kb;EN-US;q282599 and at http://support.microsoft.com/?kbid=823586. While Microsoft typically holds the number one spot they aren’t the only one with startup programs with mystery filename. Reader_sl.exe installs with Adobe Acrobat reader 7 or later as its "speed launch" utility. This file runs on system setup and pre-loads the acrobat reader so that it will launch more quickly when needed. There are multiple versions of the speed launch feature available. Typically they install with different versions of Acrobat but they all do the same thing. You shouldn't need more than one of these files running on system startup in order to get the benefit of the faster launch: reader_sl.exe, sc_acrobat.exe, _sc_acrobat.exe, sc_reader.exe, and acrobat_sl.exe. You'll find more information on Speed Launch for Adobe Acrobat, Adobe Reader, and Acrobat 3D at http://www.adobe.com/cfusion/knowledgebase/index.cfm?id=331131. Ssv.dll is a browser helper object that installs with the Sun Java Runtime Environment and Java 2 Platform Standard Edition 5.0 Update 6 or later. It will appear in your c:\Program Files\Java\jre_1.5.0 folder (name varies with version number). SSV stands for Secure Static Version. It is a feature that allows an HTML file to specify which JRE family to run. For more information about this feature, please see the documents Deploying Java Applets With Family JRE Versions in Java Plug-in for Internet Explorer: http://java.sun.com/javase/6/webnotes/family-clsid.html and the alert Java Plug-in and Java Web Start May Allow Applets and Applications to Run With Unpatched JRE: http://sunsolve.sun.com/search/document.do?assetkey=1-26-102557-1. Other popular file searches this past month include many programs which aren’t necessary. Programs that run in the background just to see if you need an updated version are far too popular. As you can see, the filenames rarely give you a clue what these files do. QTTASK.EXE - Apple Quicktime Player always come back unless disabled with WinPatrol. Google, Adobe and Apple are actually the ones using long filenames most often even though we don’t normally need their programs running in the background. GOOGLEUPDATERSERVICE.exe - Not required programs but at least you get a clue to what they do. ADOBEUPDATER.exe – Given how many vulnerabilities Adobe has been running into lately it might be worth running this one. APPLEMOBILEDEVICESERVICE.exe - Apple iTunes Mobile Connection doesn’t need to be running all the time and will be installed with iTunes even if you have a regular iPod that doesn’t use mobile services of the iPhone or iTouch. I’m not usually one to mix business and politics but growing up in America you learn that sometimes you just have to stand up and make a statement. One issue in the news that hits home is the story David Goldman of New Jersey who has been trying to be reunited with his son Sean currently being held in Brazil. In 2004, Sean’s mother returned home to her native Brazil for what was supposed to be a two week vacation. Instead she filed for a divorce and stayed in Brazil marrying an influential lawyer. Efforts for David Goldman to see his son were ignored by Brazilian officials even though a treaty between countries called “The Hague Convention” would have given Mr Goldman custody of his son. Last year, his wife died while giving birth to a child with her Brazilian husband. You might think that would solve this problem but the Brazilian courts have allowed the new husband to maintain custody and have kept Sean from returning home to his father. 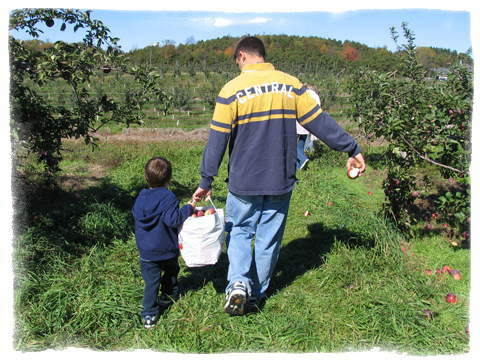 This past week it seemed like the nightmare for Sean was ending after a Federal Judge in the country ruled that Sean, who turned nine May 25th order Sean be returned to his father. In an unusual move, a small political party convinced a member of the Brazil Supreme Court to stay the transfer and now the 11 member Supreme Court of Brazil will rule on the case. They’re claiming the Hague Convention is unconstitutional and that Sean would be removed from a happy family environment he’s had in Brazil for five years. A decision is due to be revealed on June 10th. If the highest court in Brazil can strike down this international treaty it would be devastating to David and Sean. In addition the ruling would affect up to 50 similar cases currently in the courts of Brazil. Many of you have heard me talk about my grand children who live in Germany. Long story, short… while in the U.S. Army their father was stationed in Germany. He met a girl, got married and started a family. The kids have lived in both the US and Germany but at the time of their parents separation they were in Germany and had been for the previous six months. The US courts abiding by international law gave custody jurisdiction to Germany. Thankfully, in our case, the parents have common sense and cooperate so we do get to see our grandkids 3–4 times a year. Mr. Goldman has had support from both President Obama and Secretary of State Hillary Clinton so there’s probably not much I can do. My software program WinPatrol is popular around the world and we have many friends who live in Brazil. I appreciate their support in the past and it’s nothing personal but I will be blocking the purchase of WinPatrol PLUS from all Brazil domains effective immediately. The free version of WinPatrol will still be available because it’s not fair to the folks who really need the help. I just can’t in good conscious accept currency from a country who allows international agreements to be ignored. Purchases will be blocked until Sean is home with his dad and I hope our friends in Brazil understand. Current WinPatrol PLUS members in Brazil will not be blocked. Have you heard of or seen the commercials yet for Bing.com? Well, if you haven’t heard of it yet you will. Microsoft is expected to spend $80–$100 million advertising Bing. Bing.com may be the biggest new product to come from Microsoft since Bill Gates stepped down as CEO. In some respects “Bing” is the new name for a revamped version of Microsoft Live Search. What started as MSN Search became Live Search and now Bing. The joke with old techies has always been that it takes three versions before Microsoft finally gets things right. The name choice is brilliant. I suspect having this easy to remember name will be helpful in gaining public interest. No, it wasn’t named after Chandler Bing from NBC’s “Friends”. Bing is actually an obsolete verb from the mid sixteenth century that means “to go”. In the 17th century U.K. started to use the noun “Bing” to indicate a pile of something. There’s really a lot of layers to Bing. I’ll be posting a more detailed review of Bing in the near future but for now I feel very comfortable advising you to make the switch to Bing. It’s certainly worth giving it a try and you may just get comfortable with the new Bing user experience. Click to add Bing to Internet Explorer. The swing to “Bing.com” may be the biggest threat to Google’s dominance in the search engine business. Still, I wouldn’t count Google out completely. They’ve been quietly updating their search results engine. Expect the next revision of Google to customize your search results based on your location and other metrics related to your history. I also expect Google’s home page will finally introduce more graphics and personalization now that average web speeds have increased. The biggest problem I worry about in the Search Wars isn’t going to be online, it’s going to be on your computer. Both Microsoft and Google have a history of being over aggressive at retaining your search preferences. While your browser offers you the ability to change your default search engine other programs often work at keeping that status quo. This can result in an internal battle in your computer with each program changing default search settings back and forth.